How important is presidential personality and leadership style in foreign policy decisions? To answer this question, Thomas Preston takes readers inside the Bush administration's decision-making process and use of intelligence to better understand how administration officials justified the Iraq War-and how they sought to avoid blame for the consequences of their actions. Based on extensive interviews with key Bush and Johnson administration officials, Preston offers students of American foreign policy, presidential decision making, the dynamics of blame avoidance, and future practitioners with an in depth examination of how presidential personality and leadership style impacted Bush's central foreign policy failure. In addition, Preston looks critically at the oft-cited comparisons of Iraq to Lyndon Johnson's leadership during the Vietnam War, exploring where the analogy fits and a number of important differences. He shows how both presidents' styles exacerbated their managerial weaknesses in these cases and the limits of blame avoidance strategies. 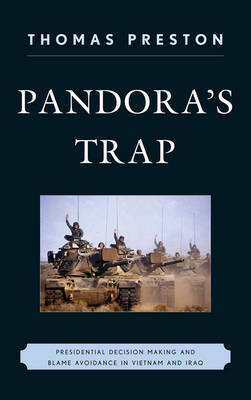 Importantly, the book provides a cautionary tale for future leaders to consider more carefully the long-term consequences of satisfying their short term policy desires by lifting the lid to any new Pandora's trap.